The Gap Apologizes For Shirts Showing Map Of China Without Disputed Territories : The Two-Way Beijing considers Taiwan a renegade province, but the shirts omitted the island and other areas under international dispute. After pressure the U.S. retailer said it destroyed the shirts. Chinese shoppers carry national flags as they pass a Gap store in Beijing in 2010. The Gap has apologized for selling T-shirts that depicted what it called an "erroneous" map of China, which showed only the country's mainland — without several disputed regions that Beijing regards as Chinese territories. The U.S. clothing retailer announced that the T-shirt has been "completely withdrawn from the Chinese market and completely destroyed." 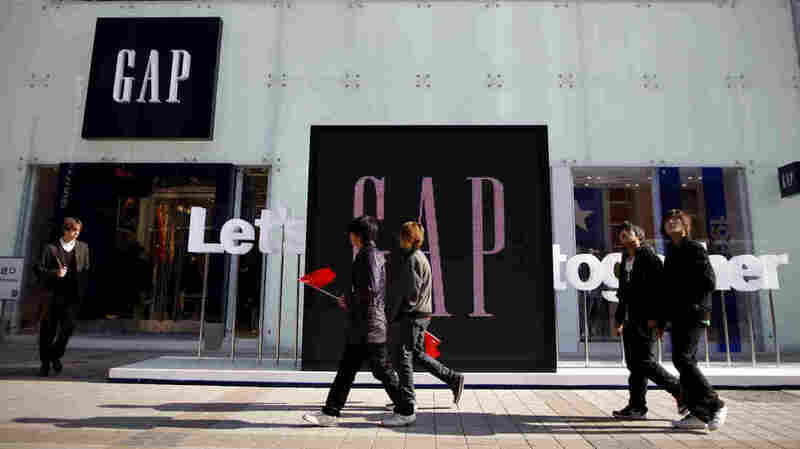 "We are extremely sorry for this unintentional mistake," The Gap said in a statement posted to the Chinese social media platform Weibo. "We are now conducting an internal investigation to correct the error as soon as possible." The company vowed that it "strictly abides" by the laws and regulations set by Beijing, which has for decades considered self-ruled Taiwan a renegade Chinese province. The U.S. also formally acknowledges China's claim on the island, under the One China policy that established diplomatic relations with Beijing in 1979 — though the U.S. continues to maintain a significant unofficial relationship with Taiwan. Taiwan was left off the map of China depicted on the T-shirt. So were other territories that have been subject to international dispute, including areas in the South China Sea and apparently an Indian-administered region of the Himalayas that China claims as "South Tibet." "The GAP Group respects China's sovereignty and territorial integrity," the company added in its statement. The People's Daily, official newspaper of the Chinese Communist Party, reports that the T-shirt had been sold in Canada. And the paper noted Tuesday that "many Chinese net users are not buying the apology." "The reason some Chinese netizens believe that it was intentional is because all of the other T-shirts in the 'City T-Shirt in Jersey' range: San Francisco, Paris, Japan, and Canada are decorated with national flags rather than a fake map," the paper added. As The New York Times observed earlier this month, it is just the latest instance of friction between the Chinese government and international businesses over how to classify the country's territorial claims. Beijing has been pressuring several dozen airlines to list Taiwan, Macau and Hong Kong as part of China in their informational materials — and now that Air Canada, for one, has decided to list the Taiwanese capital Taipei as part of China on its booking materials, Taiwan is requesting a "speedy correction" in turn. The Trump administration has pushed back on Beijing's efforts as a bid to "impose Chinese political correctness on American companies and citizens." "This is Orwellian nonsense," a White House statement asserted earlier this month, "and part of a growing trend by the Chinese Communist Party to impose its political views on American citizens and private companies." The Gap, for its part, adopted a more conciliatory tone this week. more rigorous review to prevent similar mistakes from happening again." NPR's Wanyu Zhang contributed to this report.